I have two more cards I made using Simon Says Stamp March Card Kit! I used just the stamp set to make these two cards. So the stamp set along can go a long way. Then there are the pattern papers, cardstock, watercolour panel and embellishments in the card kit. That is great value for the card kit. With out any further delay, here are my two cards. Both the cards have similar layouts but different techniques to it. For the first card, I have used watercolour technique. I white heat embossed the outline peeps images from the stamp set on Tim Holtz distress watercolour paper.Then I watercoloured the peeps using Zig watercolour clean brush pens. Once dry, I die cut a stitched rectangle panel using Stitched Rectangle die set from Simon Says Stamp. Adhered this panel on Fog card base using foam adhesives for give dimension. As for the sentiment, I white heat embossed the sentiment from the stamp set on black cardstock strip and adhered using foam adhesives. Embellished with Pretty Pink Posh Clear Droplets. 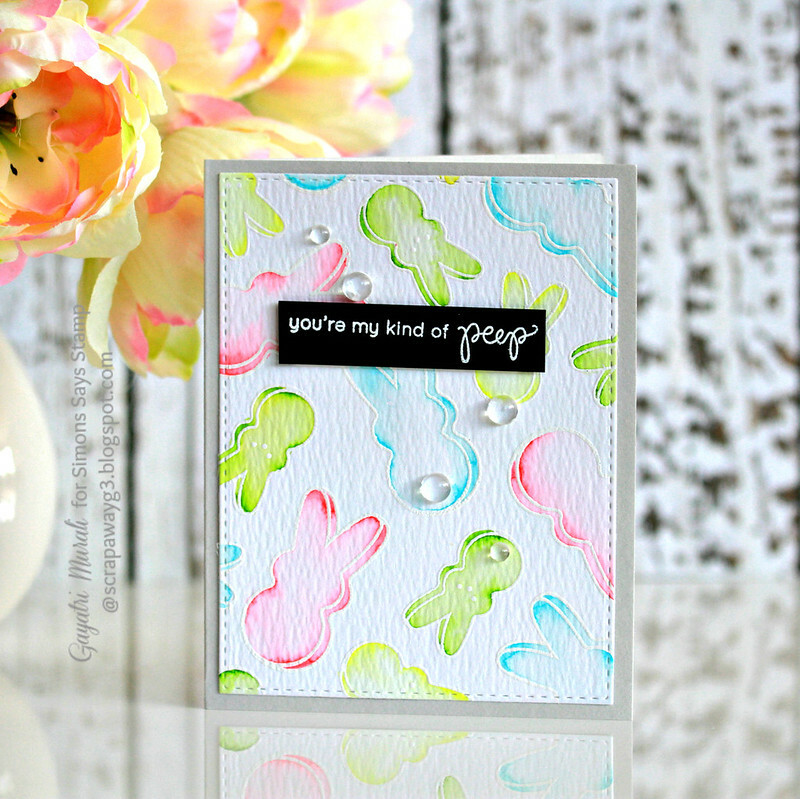 And for the second card, I used the solid peeps image from the stamp set and stamped on white cardstock for the background. I have used Duckling, Sea Glass and Twirling Tutu ink from Simon Says Stamp to stamp the background. I added the face and bows from some of the big peeps using Grey ink. Then again die cut a stitched panel using Simon Says Stamp Stitched Rectangle die set. Adhered this panel on white card base using foam adhesives. Once again the sentiment is white heat embossed on black card stock strip and adhered using foam adhesives. Finally used Sparkly Clear sequins mix from Pretty Pink Posh. Hope you like both the cards. This month’s card kit is out of stock. Simon Says Stamp card kit is awesome and great value for money. If you do not want to miss out, then you can subscribe the kit. Here is the link to the subscription. Thanks for stopping by my blog today! Have a lovely day! Great cards! Love both techniques used to make colorful cards.